WE'RE WORKING WITH OUR COUNTERPARTS ACROSS THE MOVEMENT TO PREPARE A SET OF TOOLS FOR UPCOMING RALLIES AND EVENTS. As we have designs finalized, we'll be posting them here where you can either download easily or coordinate bulk orders with your friends. Keep checking back! Click on the buttons below to download the artwork for your order. Check out Speedy Buttons as a vendor to quickly order your stickers and buttons. We recommend sizing at 2.25''. If you want to get crafty with your friends, order a Button Maker or Avery Sticker Templates and make it a DIY production. The signs below can be used to inspire your own poster creation, or you can print them out at home or a nearby print shop. If you want to print poster sized, the files are designed for 28''x 22'' posters, but can be scaled to any size poster you are planning to print. If you're printing at home, you can print on standard 8.5''x11''. 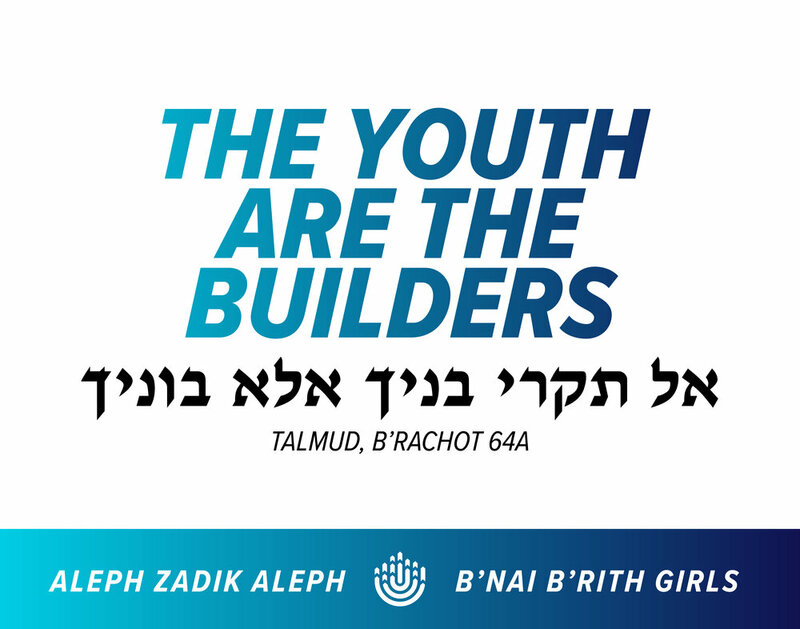 Join the thousands of Alephs and B'nai B'rith Girls in wearing the BBYO International Convention shirt to all events. Click on the shirts below to access files to order more shirts for everyone in your community to feel and look even more united. Reach out to Rush Order Tee's or any local printing vendor to get the shirts printed. Recommended to print on a Next Level Apparel 6010 - Indigo shirt. Use this flag for pre, during, and post meet-ups related to the Safe Schools initiative. Flags can be ordered from Best Flag. We recommend purchasing the 114''x30'' feather flag. Order screen printed or embroidered hats for your events. Print using the full color or white BBYO menorah on black hats. Click the hat to access files to order. Order through Rush Order Tee's or any local vendor. Download this flyer template to use for your local events. Be sure to have all fonts from the folder downloaded on your computer before you start editing. Click the image below to access files. March strong with a banner for your delegation. Order your banner through Echod Graphics. Select Vinyl Banners > 13 oz. Vinyl Banner > 3'Hx9'W (for blue banners) and 4'Hx6'W (for maroon banner). Don’t worry about the other add-ons. Upload artwork after you order and make sure to get a proof.